What happens when Coach JC interviews “The One and Only”, Tim Storey? 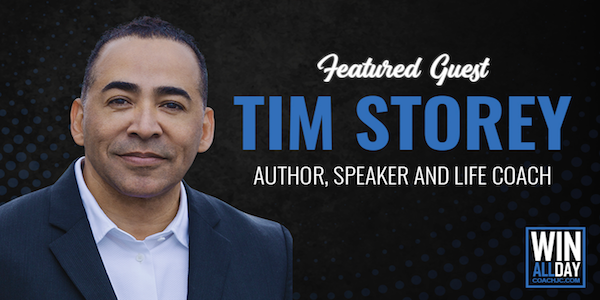 Tim Storey is one of the OG Life Coaches, a pioneer in the Professional Speaking arena and best-selling author! There are people in life that you just know you were meant to connect with at certain times in life. For me, Tim is one of those people…from what we believe, to our callings and purposes, to our heart to give and our faith. 1️⃣ Purpose – How to find YOUR purpose and much more simple it is than people make it. 2️⃣ How To Get Your “SUPREME” idea rather then just the good idea. 3️⃣How the two words “PULL OVER” could bring you immediately to produce more WINS IN LIFE! 4️⃣ You will discover “The 3 Levels of Living” and how “almost” and “most” is holding you back from living THE Utmost Abundant Life that you were called to live! 5️⃣Why over 80% of people’s dreams never happen and how you can MAKE your dreams a reality TODAY! 6️⃣How to stop searching and discover your significance and calling on this earth so that you can fulfill your destiny. 7️⃣ The secret weapon to why both myself and Tim are able to coach the amount of people we do on a daily basis and make the impact we make! PS. What you guys don’t see is the time that Tim took after the podcast to speak into my life. I am forever grateful! Thank you Tim for your time and investment. Much love brother!